I would like to inquire about your property Bayut - OF277507. Please contact me at your earliest convenience. Offer - One month free, 50 aed per Sq. Ft.
Tiffany Tower is 183 meter high-rise building that has a simple rectangular plan. Its well-designed 43-storey skyscraper at the entrance to the Jumeirah Lakes Towers development is a responds to the clients call for a unique and impressive office building. Below of this is a staff restaurant together with a gymnasium which is dedicated for guest suites and offers commercial users repression. 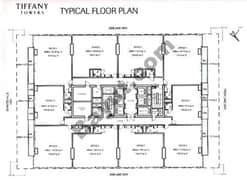 The offices are fitted with raised floor, false ceiling with AC ducting, fire alarm and sprinkler system. The advantage of Tiffany Towers is its location at W2, one of the most water-oriented plots in Jumeirah Lake Towers. Easy access to Dubai Metals and Commodities Centre, Jebel Ali Free Zone, Dubai Marina, Dubai Media City, Dubai Internet City, Knowledge Village, Emirates Golf Club, The Palm Jumeirah, major 5 star hotels and malls.